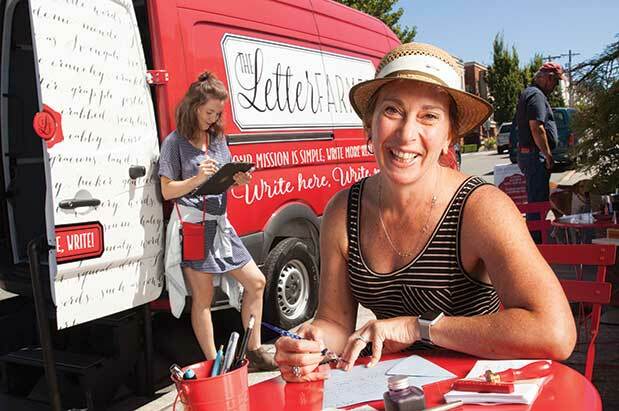 With a nod to the food-truck craze, Rachel Brandzel Weil launched her pop-up mobile paper, stationery and letter-writing business, The Letter Farmer, from a bright red truck in July. Weil, former owner of Real Card Company and a veteran of the local letterpress and stationery business, knows that everyone loves receiving handcrafted notes on beautiful paper, even though few people write them these days. Weil hopes her paper-filled vehicle will help people rediscover and appreciate the fine art of correspondence and renew their passion for handwritten letters. Weil has outfitted her cherry-red vehicle with curated paper sets and letterpress cards, writing instruments and vintage postage (prices range from $5 to $25), hoping everyone—from millennials who marvel at the novelty to old-schoolers who miss the experience—will engage in this mode of communication that’s all but become a lost art. She sets up matching red bistro tables and chairs outside the van for letter writing stations for customers to settle in to reflect and compose a handwritten message. Through September 21, the truck will be parked once a week during lunch at Westlake and Occidental Parks and is also often stationed at Peddler Brewing Company in Ballard (check the calendar on Weil’s website for locations). Brandzel Weil intends to expand her paper passion to include corporate events, visits to assisted-living facilities (with young people acting as scribes for the residents) and schools, and partnerships with local shops and venues. Look for gratitude-themed thank you note writing sessions leading up to Thanksgiving. To send your own snail mail, follow The Letter Farmer truck calendar on Instagram (@theletterfarmer) or Facebook, or on its website (theletterfarmer.com).